Beckman Coulter GS-6R Refrigerated Centrifuge w/ Rotor Swing Buckets & Inserts . New Life Scientific, Inc. Tested to 3,750 rpm at 0°C. Includes a 90-Day Warranty. 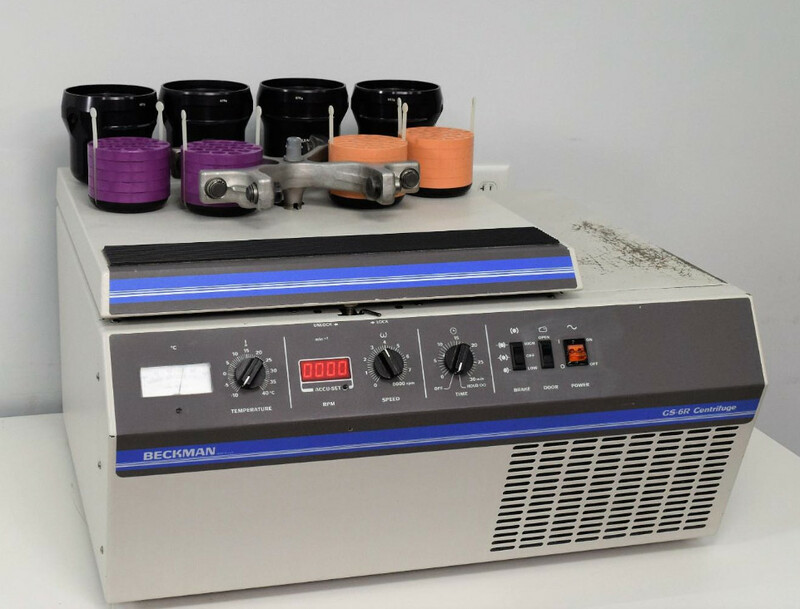 A time-tested classic, this Beckman-Coulter GS-6R centrifuge was tested and serviced by our dedicated centrifuge technician. With its included rotor, buckets, and inserts, this centrifuge is ready for use in your lab. Though it shows signs of use, we are confident in its functionality. Our technician ran this GS-6R at the rotor’s max RPM of 3,750 RPM and found no problems. The machine also reliably stays at 0°C while running. Our technician recharged the refrigeration system, greased a door latch and blew out all the dust inside the machine. The g-forces the centrifuge exerts are just as real as those exerted by a new one. At $14,000 for a new Thermo XTR Refrigerated centrifuge with swing bucket rotor, this centrifuge is priced at less than 15% of a new centrifuge.